An Iranian man imprisoned for his social media postings could face several more years behind bars if he is convicted of new charges brought against him by the Islamic Revolutionary Guard Corps (IRGC). His wife may also be imprisoned. 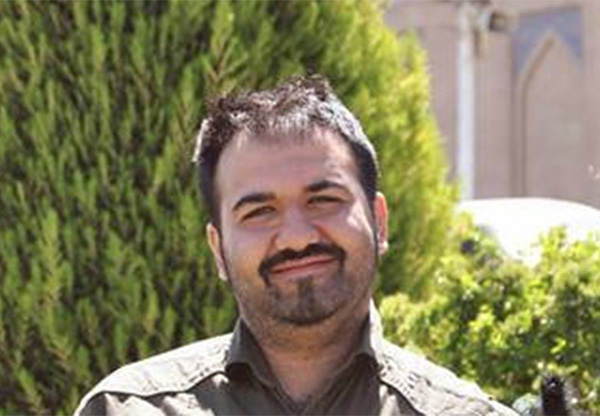 Soheil Arabi, who has been serving a seven and a half year prison sentence since 2013 for criticizing the Islamic Republic on Facebook, is facing the new charges of "propaganda against the state" and "insulting the sacred and the supreme leader," a source with knowledge about his case told the Center for Human Rights in Iran (CHRI) on September 6, 2017. If convicted of all the charges, Arabi's current sentence could be doubled. "The new charges are the same kind that have kept him incarcerated for the past four years while his wife has also been charged with 'propaganda against the state' for her posts on Facebook," the source told CHRI. "On September 4, Soheil appeared in court in Evin Prison and rejected the new trumped-up charges brought by the IRGC's Intelligence Organization," added the source. "The charges have been brought by the guards [IRGC] from the Sarallah Headquarters, who are very upset that the death sentence against him was dropped after his case was highlighted in the media," said the source. "They want to take revenge." Arabi, 32, has been on hunger strike in Evin Prison in Tehran since August 24, 2017, to demand an end to the persecution and harassment of his wife and mother-in-law. The authorities have not monitored Arabi's worsening condition or demands since he started his hunger strike two weeks ago, despite a drop in blood pressure, loss of weight and general weakness, the source told CHRI. "A week after his hunger strike, he was taken to the prison clinic for bleeding in his stomach, but he was just checked while he was standing up," said the source. "The authorities refuse to transfer him to the hospital." "Besides, they have denied him family visitation for the past two weeks because he refuses to wear the prison uniform," added the source. Based on Article 90 of Iran's State Prisons Organization Regulations, uniforms are not required unless prison authorities rule otherwise. Arabi's wife, Nastaran Naimi, was arrested on July 31, 2017, and questioned for a week about her social media posts in defense of her husband and interviews with foreign media. "Since her release from detention, Arabi's wife has not dared speak to anyone because she is being accused of contacting the media," a source told CHRI on August 27, 2017. In a letter announcing his hunger strike, Arabi said he wants the authorities to stop harassing his family. "I have forgiven all the injustices against myself, but I can never stay silent in the face of your constant and unjust harassment against my family," wrote Arabi in a letter from prison on August 24. "I will go on hunger strike to demand all charges be dropped against my mother-in-law and my dearest wife Nastaran Naimi," he added. It's unclear whether Arabi's mother-in-law is also facing charges. Arrested in November 2013, Arabi was initially sentenced to death for "insulting the Prophet" in comments he posted on Facebook that were critical of the Islamic Republic of Iran and some senior officials.